I have DAP 1325 - Hardware:A1 firmware :1.03 Eventough I have noticed there are advanced wifi settings for Wifi in installation manual, I can't see it in web interface. Am I missing anything? What browser are you using? Try IE11, FF or Opera to see if same thing happens. I have tried Chrome, Firefox and Safari. No change. 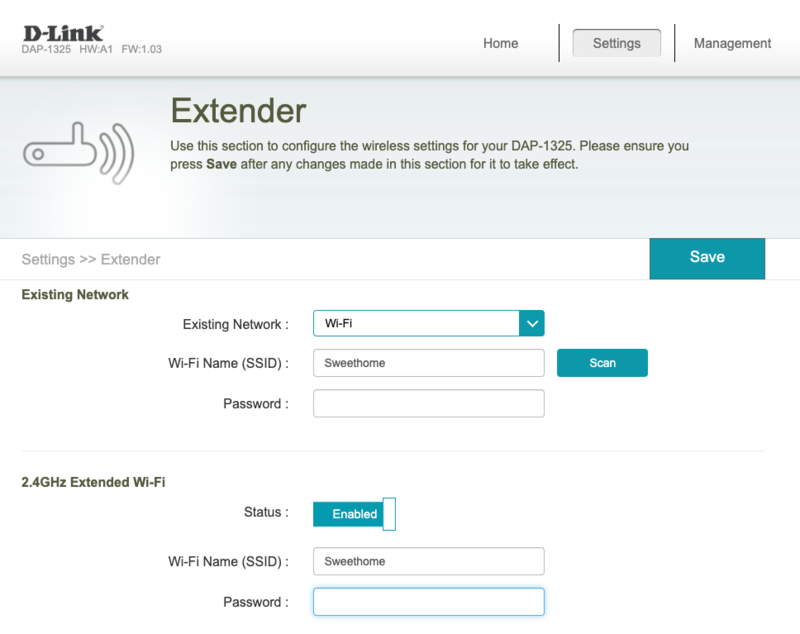 Thank you, I have reached Dlink call center, but the response was I can access advanced settings as it copies the uplink station in extender mode! He insisted that I can not even change bandwidth of DAP1325. I don't have experience with this particular DAP. Apparently, the Russian firmware allows a lot more of configuration properties than Europe and World Wide firmware. I think this is a way to reduce the functionality of this device to a simple wifi extender, which is kinda bad given the fact that, according to the Russian manual, the DAP 1325 has good hardware with 64MB DDR2 and 8MB of flash memory. At the first moment, I upgraded it to the v1.03 of the firmware, but it didn't increase the number of configuration parameters. Afterward, I tried to upgrade to the Russian firmware, but the upgrade failed. By looking at both Russian and World Wide firmware version, I noticed that the Russian firmware is a simple uBoot image with an embedded Linux while the World Wide firmware v1.03 is somehow encrypted and I could not gather any more information. Strangely, the v1.01 and v1.02 versions of the firmware is not encrypted and also present an embedded Linux. In this way, I may conclude that D-Link is encrypting its firmware and only accepts an encrypted firmware on the upgrade tool, which is a bit strange since they provide the firmware code under GPL and this code creates unencrypted images. I also couldn't find any more information regarding the encrypting process and how to change the firmware region. I also think that one can switch from the v1.01 or v1.02 to the Russian firmware, but not from v1.03 to any other unencrypted firmware, which is our case. Anyway, I just emailed dlink bout downgrading to firmware v1.01 or v1.02, let's hear what they say. IF the DAPs have recovery modes, then one could use the recovery mode to downgrade to v1.0x versions. Hi, thank you. I have tried several ways to enter recovery mode but didn't have any success so far. Any tips regarding the recovery mode for this particular device?